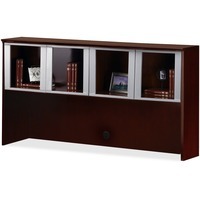 Mayline Hutch MLNCHF72CRY $166.44 Hutch adds overhead storage to 72 credenzas that are part of the Mayline Corsica Veneer Series. It is made of top grade hardwood veneer and protected with two coats of high tech catalyzed lacquer that provides clarity, heat resistance and stain resistance. Hand selected veneer ensures matching grain patterns. Hutch offers 20 12 clearance between the worksurface and the storage area. Back panel features one lower and two upper cable grommets for cord management.